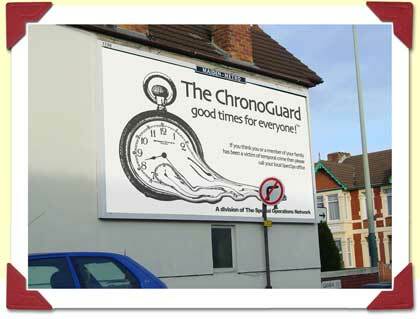 This billboard was a landmark sight in Swindon for many years as it was the only form of advertising anywhere in Wessex county for the secretive SO-12 or 'ChronoGuard'. The billboard is now dismantled and in storage for display in the upcoming 'Swindon SpecOps Museum'. Picture taken: September 1990.